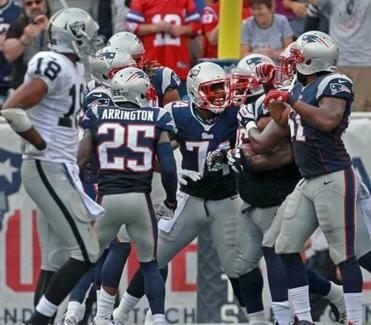 Julian Edelman said he has to protect himself better after getting blasted by the Raiders in the fourth quarter. FOXBOROUGH — There was hardly a doubt Tom Brady would be locked in on Julian Edelman. Brady already had linked up with Edelman for a pair of third-down conversions in Sunday’s 16-9 win over the Oakland Raiders, but at the start of the fourth quarter, the Patriots desperately needed another. The Patriots, hoping to extend a 1-point lead, were facing third and 3 from the Oakland 12-yard line when Brady hit Edelman in the left flat. Edelman gained 10 yards and plunged toward the goal line, only to be violently upended by a defender at the 2. The gritty effort underscored a strong performance by Edelman, who finished with 10 catches for 84 yards — his fourth regular-season game with at least 10 receptions. It was also his ninth straight with at least six catches, the longest such streak in the NFL. But for Edelman and the Patriots, it’s hard to shake the gloomy feeling that the offense is merely good enough. While the unit has been searching desperately to find a rhythm, Edelman knows there’s more to be desired. 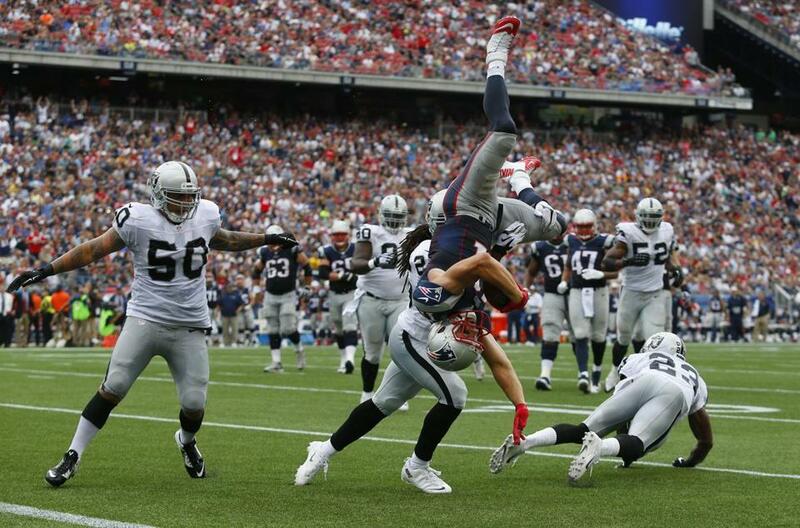 Globe staff photographers’ best shots from New England’s win over Oakland. What happened after Edelman picked up that first down early in the fourth quarter was an indication of where the Patriots’ offense stands. With a fresh set of downs, Shane Vereen was stopped for no gain, both Rob Gronkowski and Danny Amendola had touchdown passes in their grasp but couldn’t secure the ball, and the Patriots settled for a Stephen Gostkowski field goal to take a 13-9 lead. For Edelman, the lack of consistency is most troubling. “My job is to get open and catch the ball, work hard in the run game, make blocks in the run game,” he said. “There were a few times I didn’t do my job. I have to go out this week, I really have to go out and try and do my job better. If everyone does their job better, the collective unit will be better. Edelman is never one to indulge in his own stats and success. He chose to focus on the inconsistencies and improvements the team could make after Sunday’s win, but the truth was he was one of few bright spots on the Patriots’ offense. Edelman didn’t haul in his first catch until the team’s first possession of the second quarter, when he opened the 15-play scoring drive with a 12-yard gain. After that, Brady was locked in. Three plays later, Brady hit Edelman for an 8-yard catch to convert a third-and-4, then went right back to him on the next play for a 4-yard gain. Near the end of the drive, Brady hit Edelman on second and 11 for a 9-yard pickup to the Oakland 6 that set up a touchdown pass to Gronkowski on the next play. Raiders cornerback Carlos Rogers, who covered Edelman most of the game, said he was challenged by the speedy receiver. Rogers, who as a 49er two years ago faced the Patriots and former receiver Wes Welker, said he reflected on that game as he prepared to cover Edelman. “With that offense and those guys, you work on stuff you see on film, but they have another move out there,” said Rogers. “Guys like him are so quick and so fast, getting in and out of his cuts. As long as you keep the big plays off him and keep everything short and in front of you, you have a chance. Edelman is a key to the equation as the Patriots try to find their way on offense, so the team needs him healthy and on the field. The 5-foot-10-inch, 200-pound receiver was lucky to come away unscathed after his dive in the fourth quarter. Linebacker LaMarr Woodley also hit Edelman hard over the middle on a play later in the quarter that initially was ruled a 6-yard catch but was challenged and ruled an incompletion.